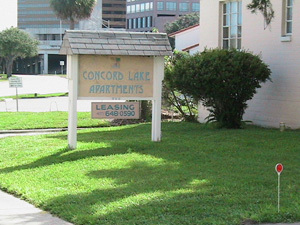 Concord Lake Apartments, Orlando, FL - Spacious one ($790) and two ($900) bedroom apartments, right off of highway I-4, Lake Ivanhoe Exit, in a very pricey neighborhood of College Park. The security deposit is in the amount of one month's rent. Great for people who do not want to pay a fortune to live in downtown Orlando. Scenic view of Orlando downtown buildings right over the water. • Pet policy: No dogs. Indoors cat permitted.